Good as gold, the saying goes. But – no so much these days? The price of gold continues to fall, reaching its lowest levels in over two years, a drop that’s causing chaos in money markets around the world. The plummeting price of gold comes as the Federal Reserve considers an early halt to its plan to buy up billions of dollars’ worth of mortgage backed securities each month – a move with implications for US interest rates and the strength of the dollar. The rollercoaster ride of gold prices dates to the fall of 2011, when process peaked at a high of $1900 per ounce after the US government’s credit rating took a hit in the aftermath of the housing collapse and other economic troubles. 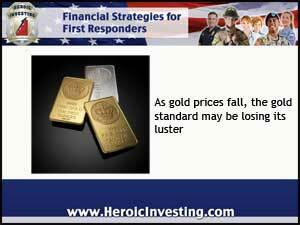 Now, in mid-April 2013, gold is trading at just under $1400 an ounce — its lowest price since February 2011. The drop in gold prices presses traders and investors to sell their holdings of the metal as fast as possible. Not only that, financially troubled Cyprus is considering a plan to sell off some gold reserves to shore up its vulnerable banking system. If that happens, and if other countries such as Italy or Spain follow suit, the market could be flooded with gold, devaluing its worth even further. In years past, gold was seen as an attractive investment against the vagaries of other kinds of currencies – and gold was the rock solid support for the stability of many of those currencies. Now, as the US economy appears to be improving, the dollar may be appreciating too – another reason for traders to divest themselves of their gold stores. That’s where the Fed’s security buying effort comes in. In the fall of 2012, the Federal reserve launched an ambitions plan to buy up billions –yes, billions – of dollars in mortgage backed securities every month for an indefinite period, in an effort to keep interest rates low and stimulate the growth of the housing market after its historic collapse. But with continued improvement in the economy as a whole, the Fed is considering a proposal to end the program. An end to the Fed’s plan could also mean an end to the artificially low interest rates of the past year or two. As interest rates rise, the value of the dollar could also rise. And since some investors trade in gold because they see it as stronger and more stable than the dollar, they may rush to sell off their shares as the market continues to improve. Rising interest rates ripple through the economy as a whole, with particular effect on the housing market. As mortgage interest rises, investors and residential homebuyers alike may have a harder time getting a good rate for financing a property – and options may narrow for those seeking refinancing due to a potential mortgage default.